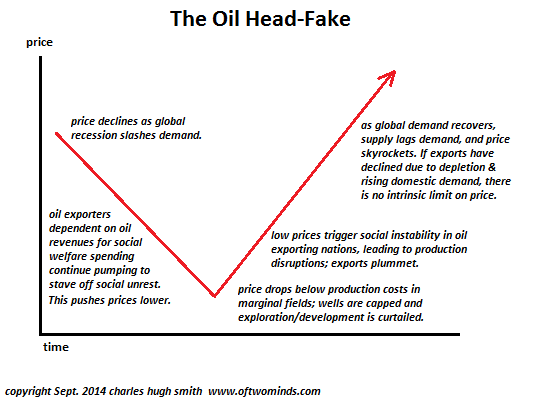 I’ve described the dynamic of structural imbalances of supply and demand leading to lower prices for crude oil as the Oil Head-Fake: high global production (supply) continues while demand declines due to global recession, and the resulting imbalance of supply and demand triggers a major decline in price. But this drop is not positive; it’s a temporary response that triggers a variety of disruptive consequences. There’s nothing fancy about a basic supply-demand pricing model; if the world is awash in crude oil and demand slides, price will eventually follow. Yes, natural gas can be substituted for vehicles that have been converted to burn natural gas, coal can be converted into liquid fuels, gasoline/diesel vehicles can be scrapped and replaced with electric vehicles–but all of these substitutes require reworking not just the vehicles but the entire infrastructure of extracting and delivering liquid fuels (or sufficient quantities of electricity) to substitute for oil. Even with natural gas production soaring due to the fracking revolution (a rise in production many doubt is sustainable), there isn’t enough natural gas being extracted to substitute for oil, except at the margins: the fuel being replaced with natural gas is coal. Even if you believe in the omnipotence of central banks, statistical reversion to the mean suggests recessions (declines in discretionary demand) have not been eliminated–they’ve just been pushed forward. Several emerging features of the oil supply story complicate the supply-demand pricing model. In the classic model, as demand drops, price follows, and at some point it’s no longer profitable for high-cost producers to continue pumping oil. As a result, they cap their wells, cease extracting oil, and eventually supply drops to match demand and price stabilizes. Oil has another peculiarity: it isn’t distributed evenly around the world. Some nations-states have large reserves, others essentially none. Those with large reserves export some of their production to those with little or no oil. Those nations with abundant oil often suffer from The Resource Curse:–due to the extraordinary wealth generated by their oil, the rest of their economy atrophies and their political/social structure is distorted by the oil wealth. Another peculiarity is the easy-to-get oil was extracted first. This makes sense in terms of cost-benefit, and the inevitable result is the oil that’s left is more difficult to extract and process. This means the cost of producing a barrel of oil has risen from $1/barrel in the good old days to $40 or more in many exporting nations. This sets up a contradictory set of requirements for oil exporters: oil exporters can only maintain their social spending and keep the regime afloat if oil prices stay elevated. When global recession guts demand and the price of oil tumbles, the exporter regimes are at risk of collapse if they can’t maintain social welfare spending. The only way to offset lower prices is to pump more oil, which paradoxically pushes prices lower. This is a double-bind: if they cut production in the hopes that prices will stabilize, this enables their competitors to keep production high: prices won’t decline. But if they pump more to compensate, prices also decline. This set up a price decline spiral as marginal production is taken offline but supply doesn’t drop along with demand. The Resource Curse establishes a positive feedback loop: in the classic model, the feedback is negative: demand drops, price and supply follow, and price stabilizes as supply reaches equilibrium with demand. It doesn’t take much imagination to discern a tipping point in oil revenues: once price declines enough that social welfare programs cannot be funded, some exporting nation regimes will be toppled by domestic instability. Others may become vulnerable to external forces. The point here is that production generally suffers mightily when regimes collapse and the Status Quo is disrupted. Add these dynamics up and we get a supply chain that is vulnerable to price declines and depletion of the cheap, easy-to-get oil. If supply is disrupted on multiple fronts–social, economic, physical–it will be incapable or rising to meet recovering demand after the forest-fire of global recession clears out the deadwood. 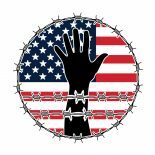 This entry was posted on September 29, 2014 by conspiracyanalyst in Earth News, Economic Warfare, Energy, Natural Resources, Oil, US News and tagged natural gas, oil, Oil Politics, Oil Prices.